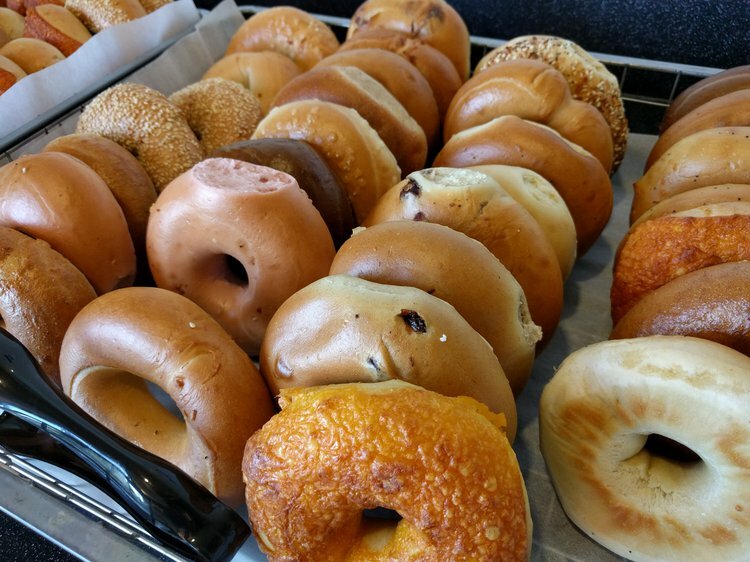 Bagels are healthier breakfast choices when they are whole-grain rather than refined products because there will be higher in fiber and nutrients found in whole-grain flour. However, many flavored bagels have additional sugar, cheese, or other ingredients that might decrease the bagel nutrition value. Bagels are an attractive morning breakfast food. Many low-fat eaters look to bagels thinking that it is a healthy choice. We cannot blanket all bagels as good or bad. It depends on the type of bagels. Bagels are healthier breakfast choices when they are whole-grain rather than refined products because there will be higher in fiber and nutrients found in whole-grain flour. However, many flavored bagels have additional sugar, cheese, or other ingredients that might decrease the bagel nutrition value. In terms of bagel nutrition facts, one plain bagel (100 grams) contains 48 grams of carbohydrates with nearly no fiber, protein, or fat. The sugar content of bagels is equivalent to more than three slices of bread and provides 250 calories from carbohydrates. Because these carbohydrates can be broken down so easily, they account for more than 16 teaspoons of sugar (or one can and a half of soda) in your blood. According to the American Heart Association, men are to eat no more than nine teaspoons of added sugar per day and women are to eat no more than six teaspoons of added sugar per day. Excess sugar consumption is associated with a myriad of diseases including obesity, type II diabetes, cardiovascular disease, certain cancers, tooth decay, and non-alcoholic fatty liver disease. According to 2002 international glycemic index database, your body quickly digests the starches in bagels faster than table sugar. A high glycemic index indicates how fast a particular food will affect your blood sugar levels. A higher score means that when people eat it, they will experience a blood sugar spike followed by a crash. These spikes and crashes can be fatal to individuals who have diabetes. Though bagels have almost no protein, fiber, or fat, enriched bagels provide vitamins and minerals. One wheat bagel (100 grams) has 2.76 milligrams of iron, or 15.3% of the daily value for this essential component of healthy red blood cells. It also has 108 milligrams of folate, which is 25% of the daily value. In addition, wheat bagels have the B-vitamin complex thiamin, niacin, and riboflavin. A balanced breakfast should include a good source of protein, but a wheat bagel only has 10 grams, or 6% of the daily value. Bagels should be eaten in moderation because of their sodium content. The American Heart Association recommends approximately 1,500 milligrams of sodium per day. One bagel has 439 milligrams of sodium per wheat bagel. Too much sodium is linked to heart disease and high blood pressure. Ackerman, Z., Oron-Herman, M., Grozovski, M., Rosenthal, T., Pappo, O., Link, G., & Sela, B. A. (2005). Fructose-Induced fatty liver disease hepatic effects of blood pressure and plasma triglyceride reduction. Hypertension, 45(5), 1012-1018. Basu, S., Yoffe, P., Hills, N., & Lustig, R. H. (2013). The relationship of sugar to population-level diabetes prevalence: an econometric analysis of repeated cross-sectional data. PLoS One, 8(2), e57873. Fung, T. T., Malik, V., Rexrode, K. M., Manson, J. E., Willett, W. C., & Hu, F. B. (2009). Sweetened beverage consumption and risk of coronary heart disease in women. The American journal of clinical nutrition, 89(4), 1037-1042. Johnson, R. K., Appel, L. J., Brands, M., Howard, B. V., Lefevre, M., Lustig, R. H., ... & Wylie-Rosett, J. (2009). Dietary sugars intake and cardiovascular health a scientific statement from the american heart association. Circulation,120(11), 1011-1020. Larsson, S. C., Bergkvist, L., & Wolk, A. (2006). Consumption of sugar and sugar-sweetened foods and the risk of pancreatic cancer in a prospective study.The American journal of clinical nutrition, 84(5), 1171-1176. Ludwig, D. S., Peterson, K. E., & Gortmaker, S. L. (2001). Relation between consumption of sugar-sweetened drinks and childhood obesity: a prospective, observational analysis. The Lancet, 357(9255), 505-508. Cross, N. (2007). Muffins and bagels. Handbook of food products manufacturing: principles, bakery, beverages, cereals, cheese, confectionary, fats, fruits, and functional foods, 1, 279. Noel, A. N., & Kumari, K. Trends in the Food and Beverage Sector of the Hospitality Industry.